To all our mothers and grandmothers and great-grandmothers too – Have a happy and relaxing day! A recycled post with one addition – I hope you don’t mind – I like to read the old posts, but that’s just me! Like many of you, I’m sure, there is some sadness and longing as I think of my mother. We celebrated our last Mother’s Day together in 1997, so today I will think about all of the good years we had as mother and daughter, and later as Grandmother and mother too. I was lucky to have her for the first fifty years of my life, as I wasn’t born until after her 41st birthday. She was an older mom, but I like to think that she had worked out all of the kinks on her older children by the time she got to me! When I was a teenager, I remember Grandma used to say “You never listen to me!” But Gram, you were wrong. I listened, and I watched and learned; and I believe that there’s a little magic piece of you inside me. I know it’s that little piece that makes me stop on my walk to the train in the morning to watch the rest of the sunrise, or pull over to the side of the road to pick up a fall leaf or smell the lilacs in the spring. Grandma used to cut fruit apart to show me the beautiful patterns inside. She watered the plants and told me to listen to them drink. She brushed the dirt off the vegetables in the garden and bit into them, telling me to taste their goodness. She sees beauty and magic everywhere. I believe she sees God all the time, in all the good and lovely things of the earth. Gram, I hope you know how rich my life is and what wonderful memories I have because you were there for me. What a lucky child I was to have a grandmother with an endless supply of “rainy day” projects and your bottomless scrap bags and boxes full of fabric, felt, sequins, buttons, construction paper, papier-mache, modeling clay, paints and brushes! You were always thinking of Kevin [her cousin] and me, planning special treats and activities for us. And you always, always had time to listen to my childish thoughts and ideas. Maybe I was “spoiled” as a child, but I think it’s great that you made me feel like the most important person in the world. Thank you for all you have given to me. Happy Birthday! Jessie always gave me a tour of the garden, site of the old barnyard, the reason for the ease at which things grew, I was told. It was here where Jessie’s enthusiasm for the simple things in life made an impression on me. It was early July, the second season for some new strawberry plants from Kraft’s Greenhouse. As we walked down the row, Jessie exclaimed, “Oooh Curtie, look! A berry!” And at that moment it seemed that I had caught the contagious joy of the first berry of the season. That thought has always remained in my mind, and I retrieve it often. It reminds me that the important things in life are the simple things, and it reminds me of my friend, Jessie. “Curtie” is a friend, who kind of “adopted” our family. He was a pall bearer at Jessie’s funeral, and I always get a nice note from him every Christmas. He has a knack for picking a beautiful and unique card. He is also an enthusiastic gardener! On Mother’s Day, I also think about the other women who encouraged and inspired me. Among my earliest memories is Aunt Flossie, also my godmother, who had a house full of grown boys when I was born, and our next-door neighbor until I was nine. She said I was “my little petunia in the onion patch”, and spoiled me a bit! She also taught me about wild flowers in the woods, and made delicious pancakes, just for me, with warm syrup in a blue Shirley Temple pitcher. My Aunt Verna was a missionary to the migrant workers in Florida in the 1950’s and 60’s, so kind, with a gentle voice. She was my mom’s youngest and closest sister, and they lived together for the last 10 years of my mother’s life. Aunt Anna, widowed quite young in life, kept the family farmhouse open for many years, a fine Christian woman, and my mother’s oldest sister. She could be a bit stern, but had a soft heart under it all. If ever anyone in our family was in need, physically or spiritually, her home was open to them. You could always count on a chicken dinner with vegetables from the garden every Sunday after church, served to whomever appeared at the table! I never knew my grandmother, but she raised five very fine women. I am thankful to have had these strong women in my life, and it is a pleasure to remember them particularly today. My daughter posted the following on Facebook earlier today. 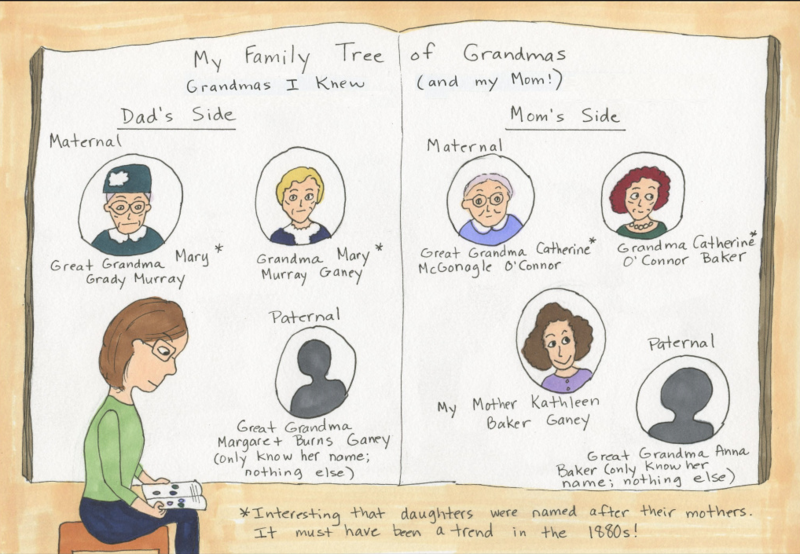 As an amateur genealogist, I appreciate the sentiment, and I hope you will like it too. I’m posting the first three panels; visit the link (above) to see the rest. Now for something a little less serious. Those of you with sons will probably appreciate this. Never having had boys, I can’t quite relate, although I have seen similar behavior by my grandsons. Please share your memories and stories about your mothers, grandmothers, and other women you honor! 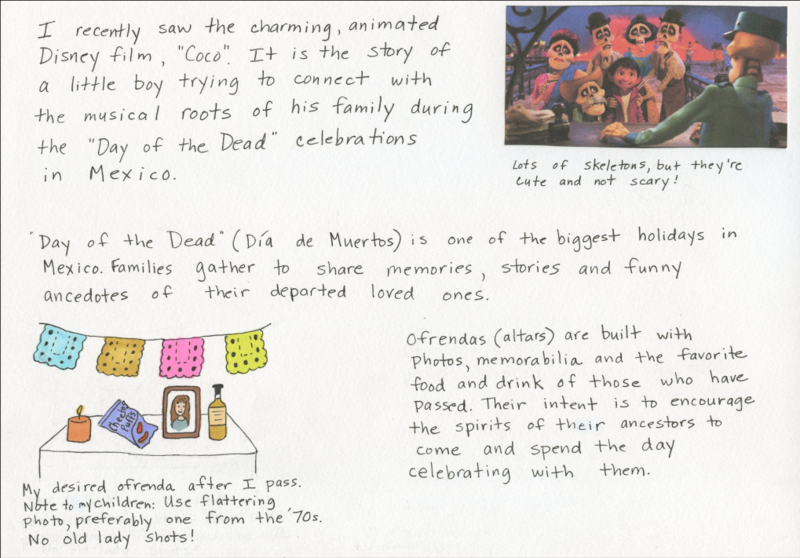 This entry was posted in Family, Holidays, Nostalgia, Uncategorized. Bookmark the permalink. 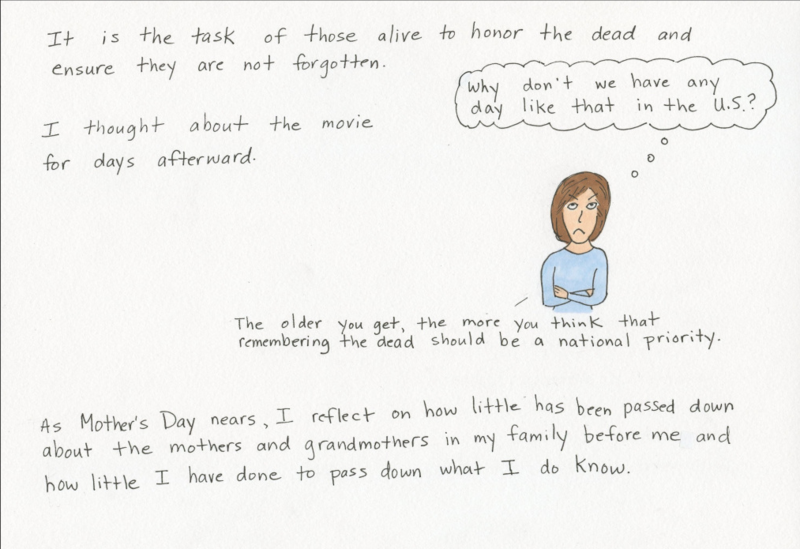 12 Responses to Happy Mother’s Day! What a lovely family! All those women, all that history, and no snowflakes to be seen. And the vid with the boys at the end was great. Lol! My maternal grandparents used to garden and grow a ton of food to can and freeze. I remember my grandmother spending several days just making egg noodles. Or the time my Grandpa harvested a single green cabbage that was so big he almost couldnt carry it and yep they cooked it. My paternal grandmother and I were very close and at the end of her life I was able and willing to care for her as she deserved. Such a good cook and baker. She gave me her time, listened to me, and loved me. I miss her a lot. Most of us have women in our families that we can remember with pride and love. They aren’t famous, but will live in our hearts forever. Sweet memories for you, Stella, and your daughter. Those are treasures to pass down to future generations. Thanks for sharing those memories and fun photos with us. My paternal grandmother passed away when I was eight and so I didn’t know her well. She was born in Indiana, and emigrated to Arkansas with her family where she met and married my grandfather. One of the things I do remember about her was the minute Dad pulled the car to the curb in front of Grandma and Grandpa’s house in California, Grandma would come rushing out the front door with her arms wide open to enfold my sister and me in her embrace. We loved going there. Other things I recall are her collections: 1) hundreds of Roosevelt dimes, when they were real silver and still relatively new, which she kept in a large lidded jar in her comfy bedroom; 2) a large button collection which she displayed in huge glassed frames on the high-ceilinged living room walls. For people who collect buttons, hers would have been a treasure trove…Revolutionary, Civil War–both sides, World War I uniform buttons, mother-of-pearl, metal, Bakelite, stone, silver from Mexico, gold-plated, bone, bejeweled, handmade covered large and small. Fortunately for the Salvation Army but unfortunately for us, Grandfather gave the collection to the charity because she attended church there; and 3) her jewelry which she would let my sister and me try on and occasionally give us if it was costume jewelry. She was a character, her hair piled on her head–not always with neat perfection, and her “grandma” dresses, high top shoes, pierced ears, and floppy hats to wear in the sun when she collected sea shells. My maternal grandmother was a multi-talented, artistic woman who was the oldest child of five from a well-off, propertied Midwest family. Despite her talents, she was not allowed to go to college like her brothers and sisters did eventually. Being a dutiful daughter, she obeyed her father who decided that she should stay home to take care of her younger siblings so her own mother could continue her profession of nursing and midwifery. When she turned 20, however, she left home to attend millinery school in Missouri. Among my treasures are sepia photos of her and her classmates and a shot by herself modeling one of her hat creations. She remained a hat and clothing maker after she married at age 30, continuing those skills for her children and my grandfather plus setting herself up in business as the town seamstress. I remember her kindness, sense of humor, and the love she showed to us girls and my mother. Because of hard times, my mother had to begin working at age 13 as a “mother’s helper” and was not able to finish high school. So my grandmother, in order to encourage my mother to work toward her GED, scheduled night classes for herself on the same nights as my mother attended classes so they could go together. Mom adored her “class act” mother. She passed away when I was 18. My mother inherited her Mum’s sense of humor and love of laughter. I remember her guffawing at jokes my father told or at funny situations within the family. Theirs was a love match. She and Dad met at a Baptist church in Ventura, California when she was 18 and he 28. She’d been invited to a Sunday evening service by a girlfriend and noticing a handsome black haired, tanned man in the choir, asked her friend who the good looking Spaniard was. Her friend giggled and told her he wasn’t Spanish but if she wanted to be introduced, she’d have to wait in line because he was very popular. Well, she didn’t have to wait because when she went to the young people’s meeting after church, he introduced himself to her as she sat on the piano bench finger-picking out a tune! His line was, “Do you play?” Her response…”Not really.” He countered with, “I play the saxophone in the church orchestra. My name is Ted. May I give you a ride home?” LOL! Because her parents wouldn’t approve, she turned him down, but invited him to call on her the following weekend to meet those parents…which he did and they dated for two years before becoming engaged and then eloping to Santa Barbara, marrying at the County Courthouse. My brother was born two years later, then my sister, and then me. Mom and Dad endured the death of my brother in an accident; the tough war years when so many members of their families went to the Pacific theatre in the army and the navy and came back injured in body or mind; my father’s illness when he couldn’t work; and the paying off of huge doctor bills once he returned to his job. But they were made of sturdy stock and prevailed in such a manner that my sister and I never felt deprived or embarrassed. Mom was a great companion. We had some fun times together going to plays, musicals, museums, lunches, teas with my gal pals, and simply shopping, after my father passed in 1989. Both my female and male friends adored her and she them. She was musical, loved her family, loved animals, loved people in general and didn’t feel uncomfortable with any other ethnicity, loved God, never spoke cruelly against others, and not once during the last 15 years of her life when things were up and down for her physically, ever complained about her lot. In her final year when she could no longer walk, I would take care of her needs before bed, tuck her in, and kiss her good night. As I went to my room, leaving the door open should she need me, she would always call out, “Good night! I love you!” I’ll remember that forever. She passed in 2006. Thanks Grandma C and Grandma B, and thanks, Mom, you were the best! Great memories, Lucille! We are very lucky to have them. Indeed we are. Any number of friends had families which were difficult. In my book, they are all the more admirable for having overcome so much. As I’ve discussed with many of them, no parent (unless there is a personality disorder) starts out with the intent to ruin his or her children. Coping abilities are mostly learned but also part personality. Generally, parents do the best they can and are sorry for the worry or trauma they may have caused their offspring. One close friend and I went round and round about the need for forgiveness regarding whatever poor parenting anyone endures, even if the parent rejects responsibility. Years later I heard her offering the same advice to others in order to gain personal healing. That made me very happy. Family dynamics can be complicated. And so the same applies to parents needing to forgive their children. Thank you for sharing such a beautiful rich history Lucille ❤️. You’re welcome, lovely. Stories…got a million of them. Mom wasn’t faultless, of course. She was tall and took pride in her body strength. There were times she could be a tad stubborn if you wanted to help her do something and she felt you were indicating she couldn’t do it herself. LOL! All our adulthood she was always stronger than either me or my sister, until the final years. Even then her upper body strength was impressive, pulling herself to a sitting position to get to her little frig by her bed where I placed her food for the day when I had to go to work. Her room was set up for all her needs and she maneuvered about with skill. Amazing! Me too. And Stella, let me tell you, that video is dead on. My husband and I had a beige laugh at that. All three sons and their families went to a wedding last night. They really had a great time, but we could have made a similar video. Even the straight guy in our family gets lost in the humor.